AMCAT Reviews - "AMCAT exam can introduce you to a lot of job options"
Searching for a job can be an uphill task, especially if you are a fresher and don’t know where to look. And, this is exactly where the AMCAT exam comes in; offering the best job opportunities and introducing candidates to a variety of recruiters. How was your AMCAT experience and why did you opt for it? While looking for a job Kaveri faced a lot of difficulties before being introduced to the AMCAT exam through her college. Encouraged by her teachers, Kaveri gave the AMCAT exam and “had a good experience” with it. How was the interview process and how did you prepare for it? It is a very smart move to prepare for the interview questions well in advance, much like Kaveri did. This will give you an idea on what to expect and how to frame the questions that would leave a lasting impression. Preparing for interview questions beforehand also ensures that you are not left fumbling at the last minute. 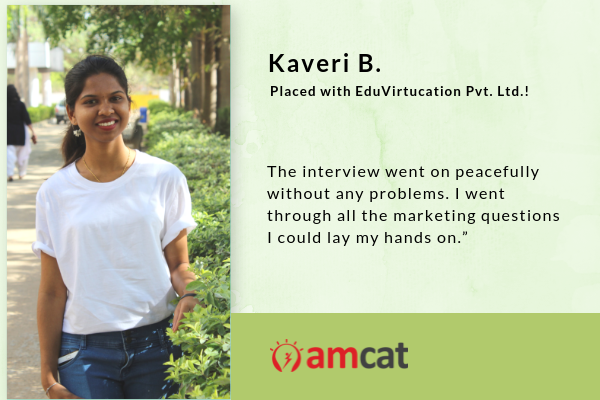 Kaveri has surely set a great example for all job seekers and has proven her mettle through the AMCAT exam. And, you too can pull off a Kaveri and write your own success story with an ample dose of hard work, smart work and faith. In case you have any doubts or queries, or you want to read more AMCAT reviews, check out our success stories section.